tsk tsk~ - A mummy's inane blabberings.. This afternoon while having lunch at a crowded, noisy joint, Aidan stopped midway while eating and suddenly yelled out what sounded like"F**k You!". Both hubby and I were dazed for a while..we looked at each other and queried at the same time "Did he really say what I heard he said?!".. And so we tried to make Aidan repeat himself but in vain. He had this mirthy grin on his face and was giggling away *face palm*. Gawd..I hope he didn't pick it up from me... If anyone's guilty, it has gotta be me 'cos hubby isn't the sort to swear (well, only when he's driving though). But I don't recall cussing in front of him especially using that phrase! Gotta be really careful with my language around him. Let's hope there won't be any repeat performance. Thankfully the place with really noisy or else the other customers would be wondering what kinda kid we have [and the type of parents we are :P] *awk*! this was how he looked when the waiter took away his plate of fries..
Was supposed to gave gone for the Samsung Inline Blading thing at Padang this morning but I woke up late (at 9am)...didn't even hear the alarm clock ring. Guess I was too tired! 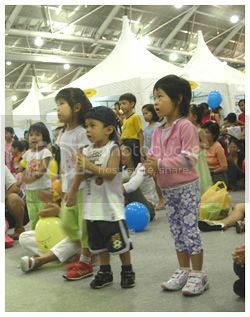 Some photos taken last Saturday at the Children's Day Carnival@Expo..
We were there quite early..abt 11am so the place was quite empty then..
Had to help out with a tea ceremony for my bro and sis-in-law last week. It was kinda strange because Stephen & Jen have been married for more than 6 years and are having their first kid soon (in abt 1 week's time). But they've not gone through a traditional chinese wedding yet though. Not sure why it never took place..seems like they were just too busy to organise it and then after that, they simply forgotten abt it..We learnt later from Stephen that his in-laws had always felt unfair for Jen because she never had a 'proper' wedding. But it was too late to organise anything big scale..Furthermore, dad just passed away and according to mom, we had to do it before the one month anniversary of his passing as the next few months after that were supposed to be the mourning period. So, I was tasked with the duty of preparing the items..First was the dowry. Heh..diamonds are always the best! I know Jen wouldn't want the traditional yellow gold so I got her a diamond set consisting of a necklace, earrings and bracelet. 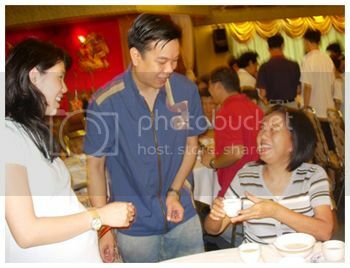 Then I had to enlist the help of hubby's parents. Mom insisted that the person carrying the items to Jen's parents place had to be a neutral party (would be good if it was from a happily married couple she said)..Thankfully, my in-laws were understanding and agreed to help us. 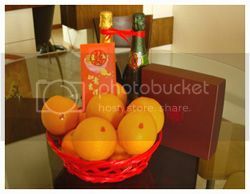 They even helped me buy the mandarin oranges and a nice basket to place them in it..Plus a nice big angpow courtesy of my mom ..and we were done. Yeah, not very grand i know..no suckling pig or any big items but too rushed lah. couple of champagne *check* and big angpow *check*..
We realised one of the mandarins was missing..
Yeah..we had to do the tea-serving at a dimsum restaurant..
a li' strange I know but at least the parents were satisfied (i hope)..
And that du lan face... PRICELESS! Hahahahaha. U look like u lost A LOT more weight from all the New Face stress! 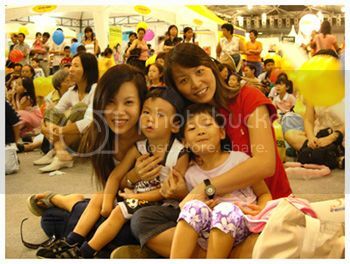 Very chio! yeah he perpetual dl face..since baby siah. think i lost another 1.5kg or so..dun wanna lose anymore weight lah! Not chio..haggard. You should see my eyebags. Photoshop helped! heh..next time we go out, i can swear in front of you ah! 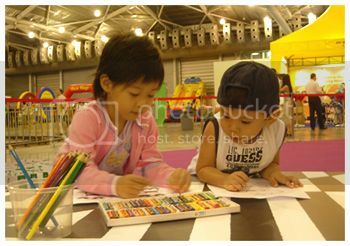 (must make sure aidan not ard)..
oops..havent had time to qc my entry hehe.. 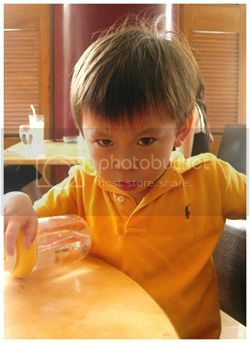 This afternoon while having lunch at a crowded, noisy joint, Aidan stopped midway while eating and suddenly shouted what sounded like"F**k You!".. Oh no!! ya its a good thing it was noisy so no one heard it. Its crazy what kids pick up from people. He actually might not have picked it up from you but from someone somewhere else..who knows? Judging from his reaction after you asking him to repeat it he probably knows what he said is bad. But ya hopefully he won't say it again. he only watches kid shows so it cant be tv. 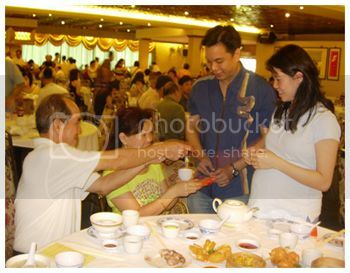 i'm sure it feels kinda weird to hold a traditional chinese weddin after 6yrs of marriage! 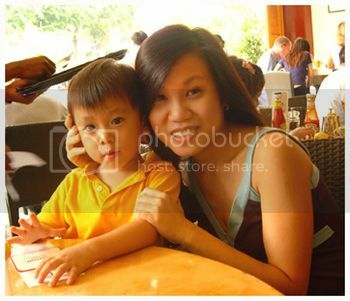 heh..
Aiyoh Angie..what on earth have you been teaching him?! after 6 years?! your in-laws are pretty easy-going people? heh his shoes ah :) a xmas gift! OMG..that got me laughing.. haha..
Heh..he always have this DL look. 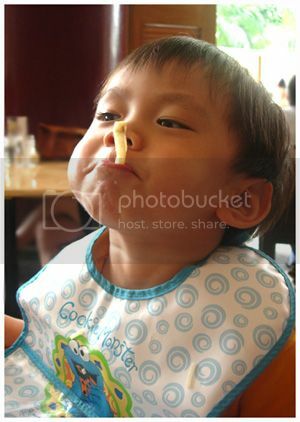 Hopefully, he's not gonna be like that when he grows up or else sure kiam-pah! eep... hope that he didn't pick up any 4 letter words so far. It would be scary if anyone at a tender age were to use those words! I always bring Tim to the office and my colleagues would be those who would 'encourage' him to use words like 'sh*t', 'assh*le' etc... at home, it would be 'cr*p' and 'f*ck ' courtesy of Troy... I always fear the day would come when Tim started saying these words. His 'buay song' face is so funny! This boy sure loves his food! yeah..i hope so too. Am hoping that we heard wrong! Wah..ur colleagues quite evil eh! Need alot of self control not to swear..Im cuss quite alot i admit but i try my best not to do it infront of him. Boy eats too much lah! Bottomless pit! 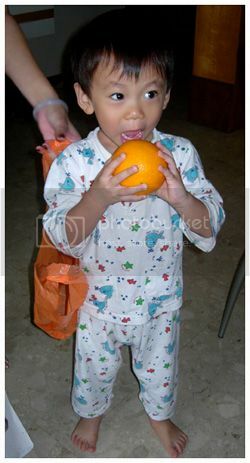 heh..u probably last seen him when he was just a toddler..he's now almost 3 years old already! Yeah, somehow managed to lose weight after started working. too fast lah! And picking up the wrong stuff *awk*! Yeah i guess. I know Im hoping that he picks up words faster but NOT THESE KINDA WORDS!!! i really wonder who decided such things, like you have to get married before the year if someone in the family died or you can't marry for next three years blah blah. yeah vain mommy likes to dress up her kid. But i've stopped buying clothes for him already. I bought lotsa clothes for him..most usually abt 1 to 2 sizes bigger esp when I was in US and HK and so he's now got way too many clothes.